Curtain: Poirot's Last Case by Agatha Christie is a reread for me. I read this mystery novel decades ago while I was either in high school or college. I went through an Agatha Christie reading spell during that time period and read many of her novels or short stories. I remember reading Curtain: Poirot's Last Case by Agatha Christie back in the day and being quite fond of it at the time. So when I rediscovered Curtain: Poirot's Last Case by Agatha Christie at a local Little Free Library earlier this year, I looked forward to rereading it once again. Although it was fun to reread Curtain: Poirot's Last Case by Agatha Christie again (I've always liked Hecule Poirot as a character), sadly I must admit that I didn't enjoy it as much the second time around. I felt like Curtain: Poirot's Last Case by Agatha Christie was a bit on the slow side for the most part. It didn't pick up until the final few remaining chapters left of the novel. I also felt like some of the personalities of a few of the characters were a bit off (or dated??? ), like that of Judith Hastings, Captain Hastings's adult daughter. Judith is in her 20s, but I felt like Judith was too independent/defensive and wouldn't even hear of anything her father would say to her out of concern. She'd be rude and tell him off saying he had no right to say anything to her about his concerns. Plus, there was a discussion among a few of the characters in one scene that seemed to touch on the premise of eugenics, which felt kind of odd to read. Captain Hastings seemed rather daft throughout Curtain: Poirot's Last Case. For someone who'd been working with Hercule Poirot for so many years, I would have thought he'd been able to pick up on clues a lot better than he did during Curtain: Poirot's Last Case. Instead, Captain Hastings doesn't figure much of anything out at all. It isn't until he reads Hercule Poirot's manuscript/postscript at the end of the novel that he finally understands everything. I have pros and cons with Hercule Poirot's manuscript/postscript that is left for Captain Hastings at the end of Curtain: Poirot's Last Case. The Pros for me are that we see the complexity of the novel and how things actually panned out. I also thought it was cool that Poirot's first and last case should be at Styles... However, it wasn't the ending I would have expected for this novel. 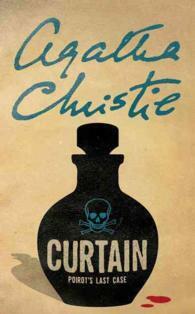 In many ways, I felt like Agatha Christie's ending for Curtain: Poirot's Last Case by Agatha Christie is pure genius... In other ways, I felt like it was a cop out to readers to have the novel's ending have to be explained to the readers through a written manuscript/postscript from Hercule Poirot to Captain Hastings. Not sure at this point in time how I feel about the ending of Curtain: Poirot's Last Case by Agatha Christie. I think it will take some time to sort out just how I feel about Curtain: Poirot's Last Case's ending. The Queen of Mystery has come to Harper Collins! Agatha Christie, the acknowledged mistress of suspense—creator of indomitable sleuth Miss Marple, meticulous Belgian detective Hercule Poirot, and so many other unforgettable characters—brings her entire oeuvre of ingenious whodunits, locked room mysteries, and perplexing puzzles to Harper Paperbacks. The legendary detective saves his best for last as he races to apprehend a five-time` killer before the final curtain descends in Curtain: Poirot’s Last Case. Do you reread books? Does your view of a book change over time?? I am giving Curtain: Poirot's Last Case by Agatha Christie a rating of 3 stars out of 5 stars. Not being much of an Agatha Christie fan, I can't really comment. I do know that mysteries which end like this one with an explanation really bug me. As far as rereading goes, it is almost always a risk for me. Will I still love a book as I once did? Yes, the explanation ending bugged me too... It made me feel like it was a cop out on the author's part. I expect more from an author like Agatha Christie. Hello! Haha late as always... :D Anyway, I totally get the whole read it once, love it, read it twice... meh. I feel like that's a common theme with mysteries and sometimes I don't know how to rate a book then. Like it was really good the first time around, but because you know how it ends, will it really be as good the second time and should that impact a rating? It's a really weird situation. Still, I do agree that I don't think Curtain is AC's best work (although I really liked it the first time around). It's nicely put together though. I don't feel like Agatha Christie was on her "A" game with this novel and was just trying to end the series... I once heard (or read, maybe??) that Agatha Christie didn't like Poirot's character much, but felt compelled to keep him around as he was so loved by her readers. Anyway, I think she pretty old at the time she wrote Curtain. Little Free Library in Danville, California!! I've Been Rereading Books Lately!